Boris Maslennikov utilizes the wood-burning art as a vital tool to present the fantastic traditions of the Russian fairytales. The exhibition includes a large group of 15 wood plates. It’s a fantasy world of famous Russian Folklore artist Ivan Bilibin, the Russian Golden Age Illustrator of 19th century. Two artists in this exhibit are connected through time portraying the ethereal world of fairy tales. Attendees will be treated to a performance by Irina Petrik, soprano, performing Russian opera arias by Glinka, Rachmaninoff, Borodin, Mussorsgsky, Serov, and Tchaikovsky. A native of St. Petersburg, Russia, Maslennikov moved to the United States 20 years ago, and has been living in downtown Cohoes, NY for a decade. Boris is a professional musician. However, ten years ago he taught himself the art of wood burning. Boris developed a great pleasure and love for working with wood. Now he is a master of pyrography, the fascinating and unusual art of burning wood. Boris invented his distinctive color mixing techniques to create beautiful transparent pastels, bright colors and finishing lacquers. 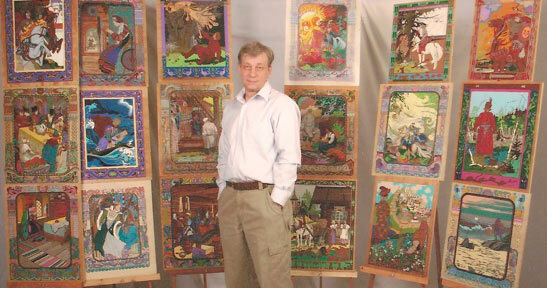 His wood burning work, which illustrates Russian folk and fairy tales, decorates his studio and has been exhibited at local events in the Capital Region of New York State. Boris showed his art at the Colonie Town Hall (2009), Washington Armory (2010), Hudson Valley Community College (2011), Senior Parkview apartments, Albany (2011). He is an active member of the New Russia Cultural Center. His works were displayed at the Russian Winter Festivals of 2009, 2010 and 2011. Maslennikov’s wood burning art pays tribute to the Russian poet Alexander Pushkin, whose fairy tales are well loved, and the famous Russian Golden Age Illustrator of 19th century – Ivan Bilibin, who illustrated Pushkin’s fairy tales. Having been inspired by Bilibin’s illustrations of Pushkin’s tales, Boris launched a creative idea: to project the illustrations on to the wooden panels! Boris utilizes the wood burning art as a vital tool to present the fantastic traditions of the Russian fairy tales. The pictures Boris draws are based on Bilibin’s illustrations, but Boris use brighter, contemporary colors. Boris Maslennikov has made the Bilibin’s illustrations come alive again. In the exhibition these two artists are connected though time as both portray the ethereal world of fairy tales. A newcomer to upstate New York, Irina Petrik is quickly gaining popularity as an emerging Russian soprano in the Capital Region and beyond. Originally from the city of Kiev, Irina started out as a piano major at the age of 6. Later at the age of 11, she joined the cast of a popular children’s theater “Skazka” and enjoyed traveling and performing all over the former Soviet Union. At the age of 14 Irina became a member of the Kiev State Youth Symphony and Choir led by Dmitriy Gershkovich. Shortly after she became their leading soprano soloist, singing in “Christmas Oratorio”, “Magnificat, “St. Mathew’s Passions” and many other oratorio works. After singing “Laudate Dominum” solo by Mozart at the Big Hall of Kiev National Academy of Music, she got encouraged to audition for the upcoming young vocalist search. She graduated with honors from the famous Kiev Gliere Music Institute, after receiving a full 4-year scholarship to study Voice Performance from the Ministry of Culture of Ukraine as a winner of a nationwide vocal competition. After coming to America, Irina continued to pursue her passion for music and is a recent graduate of the San Francisco Conservatory of Music, where she was a student of Pamela Fry. While at SFCM, Irina appeared as Adina in L’Elisir d’Amore by Donizetti, Anastasio in Giustino by Handel, Miss Pinkerton in Old Maid and the Thief by Menotti, Governess in Turn of the Screw by Britten and Alice Ford in Falstaff by Verdi. After performing at the Bay Area Russian Festival, she was described as “the most promising young discovery of the Russian Bay Area” by the “Kstati” Russian American Nespaper. Her most recent engagements include collaboration with Arizona Opera, Lake George Opera, CR Productions at Cohoes Music Hall, Hubbard Hall Opera Theater, Festival of Nations and Mosaic Arts Opera. Irina feels grateful for all of the amazing opportunities that were given to her and is thrilled to share her love and appreciation for music with everyone here today. This entry was posted on March 3, 2012 by admin in 2012.